JBF DC West is for sale! With sales two times a year, JBF will help you get through the next season and keep you within your budget! Save anywhere from 50% to 90% off retail prices on all the things you need for the next stage fo your child's life - all under one roof! We gladly accept cash (preferred), Visa, MasterCard and Visa! Kids and strollers welcome - Alliant charges for parking. GET TICKETS to claim your FREE entry ticket! Additional items added to the sales floor! GET TICKETS to claim your entry ticket! * Many items sell for 50% off! Look for the tags WITHOUT a star! Team Members & Consignors - Please see Consignor Details page for more information on when you can shop! A limited number of tickets are available for you to shop BEFORE the Opening Day! Each ticket is $15 and allows 1 person entry. GET TICKETS to claim your ticket today! 3:00PM - 8:00PM Prime-Time Shopping with your nursing infant in a sling or carrier prior 6:00PM (if you choose to bring your little one!). Children under 12 and strollers welcome after 6:00PM for Family Shopping! 4:00PM-8:00PM - Registered First-time Parents, Grandparents, Foster parents + spouse and a friend with your nursing infant in a sling or carrier prior 6:00PM (if you choose to bring your little one!). Children under 12 and strollers welcome after 6:00PM for Family Shopping! GET TICKETS to claim your ticket! See Consignor Details page for more information! 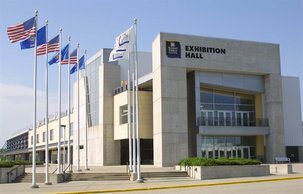 Join us at Alliant's Exhibition Hall D.
Parking is available in from the the hall. Alliant charges for parking during the public sale hours. What is JBF? It's a way to say YES to things your child needs! Families sell their items for well below retail, allowing you huge savings - from clothing, books, puzzles, strollers, toys, shoes, car seats, boppies and so much more! Did we mentions books and toys?? Just Between Friends is a fun, fashionable, affordable and an oh so friendly way to meet new friends! Come see what the excitement is all about! It's organized like a retail store. Prices are 50% - 90% off retail. Items are all in good condition-Many new! GREEN living is our goal! "Easy check in, fast check out "
"I make enough money selling clothes in outgrown sizes to purchase clothes in the sizes I need for the same amount or less, I like supporting less consumption of new goods (especially clothing) when possible, and Teri is awesome." Let JBF Help You Make Money! Is your target market moms and dads with young children? Email me for more information! I'm your sales event coordinator helping provide families a place to stretch the family budget. I'll help you find a new home for your gently-used children's items and provide other families the chance to buy your items at great prices at the sales event! It's all about families helping families! So let the JBF family help your family, too!